Hoverboard or Jet Pack With That Martini? Personally, I’m still waiting for the advent of Star Trek-like teleportation to get me from point A to point B. But, in the meantime, and Hyperloop notwithstanding, I’ll go for the hoverboard. It looks like a much more technically finessed product than James Bond’s jet pack. Check out this Wired report on a recent record-setting hoverboard adventure around and over Saussett-Le-Pins, near Marseille, France. Video: Franky Zapata set a new record for the farthest hoverboard flight. Courtesy: Guinness World Records. My thoughts are with the innocent victims, and their families and friends, of the horrific and cowardly events in Paris, France. 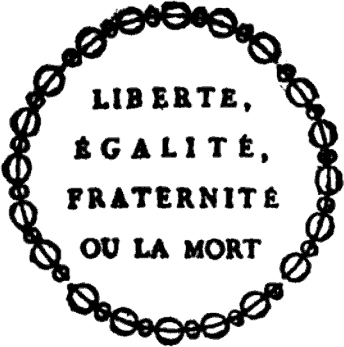 Image: The motto of the French Republic — Liberty, Equality, Fraternity or Death. courtesy of Hector Fleischmann, La guillotine en 1793, Paris: Librairie des Publications Modernes, 1908. Public Domain. French children, it seems, unlike their cousins in the United States, don’t suffer temper tantrums, sit patiently at meal-times, defer to their parents, eat all their vegetables, respect adults, and are generally happy. Why is this and should American parents ditch the latest pop psychology handbooks for parenting lessons from La Belle France? When my daughter was 18 months old, my husband and I decided to take her on a little summer holiday. We picked a coastal town that’s a few hours by train from Paris, where we were living (I’m American, he’s British), and booked a hotel room with a crib. Bean, as we call her, was our only child at this point, so forgive us for thinking: How hard could it be? Our strategy was to finish the meal quickly. We ordered while being seated, then begged the server to rush out some bread and bring us our appetizers and main courses at the same time. While my husband took a few bites of fish, I made sure that Bean didn’t get kicked by a waiter or lost at sea. Then we switched. We left enormous, apologetic tips to compensate for the arc of torn napkins and calamari around our table. 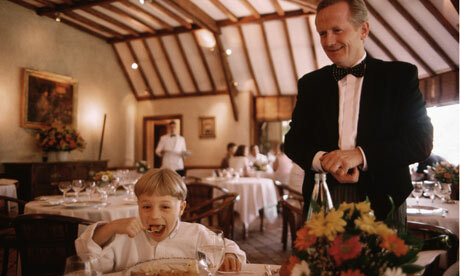 After a few more harrowing restaurant visits, I started noticing that the French families around us didn’t look like they were sharing our mealtime agony. Weirdly, they looked like they were on vacation. French toddlers were sitting contentedly in their high chairs, waiting for their food, or eating fish and even vegetables. There was no shrieking or whining. And there was no debris around their tables. Though by that time I’d lived in France for a few years, I couldn’t explain this. And once I started thinking about French parenting, I realized it wasn’t just mealtime that was different. I suddenly had lots of questions. Why was it, for example, that in the hundreds of hours I’d clocked at French playgrounds, I’d never seen a child (except my own) throw a temper tantrum? Why didn’t my French friends ever need to rush off the phone because their kids were demanding something? Why hadn’t their living rooms been taken over by teepees and toy kitchens, the way ours had? Soon it became clear to me that quietly and en masse, French parents were achieving outcomes that created a whole different atmosphere for family life. When American families visited our home, the parents usually spent much of the visit refereeing their kids’ spats, helping their toddlers do laps around the kitchen island, or getting down on the floor to build Lego villages. When French friends visited, by contrast, the grownups had coffee and the children played happily by themselves. By the end of our ruined beach holiday, I decided to figure out what French parents were doing differently. Why didn’t French children throw food? And why weren’t their parents shouting? Could I change my wiring and get the same results with my own offspring? Driven partly by maternal desperation, I have spent the last several years investigating French parenting. And now, with Bean 6 years old and twins who are 3, I can tell you this: The French aren’t perfect, but they have some parenting secrets that really do work. This season’s Beaujolais Nouveau is just over a month away so what better way to pave the road to French wines than a viticultural map. The wine map is based on the 1930’s iconic design by Harry Beck of the London Tube (subway). 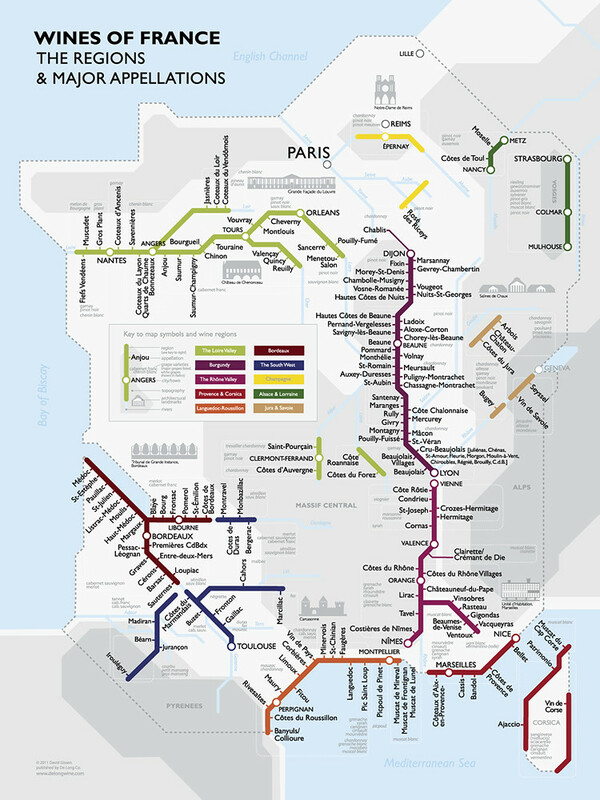 The coloured lines on this wine map denote the main wine-producing regions in France, the dots are significant cities or towns in those regions. Names that branch off from the main line via little streaks are the so-called appellations . This schematic approach is illuminating for non-aficionados. In the first place, it clarifies the relation between region and appellation. For example: Médoc, Margaux and St-Emilion are three wines from the same region. So they are all Bordeaux wines, but each with its own appellation. Secondly, it provides a good indication of the geographic relation between appellations within regions. Chablis and Nuits-St-Georges are northern Burgundy wines, while Beaujolais is a southern one. It also permits some comparison between regions: Beaujolais, although a Burgundy, neighbours Côte Rôtie, a northern Rhône Valley wine. And lastly, it provides the names of the main grape varieties used in each region (the white ones italicised), like merlot or chardonnay. Why Are the French Not as Overweight as Americans? PARIS — You’re reminded hourly, even while walking along the slow-moving Seine or staring at sculpted marble bodies under the Louvre’s high ceilings, that the old continent is crumbling. They’re slouching toward a gerontocracy, these Europeans. Their banks are teetering. They can’t handle immigration. Greece is broke, and three other nations are not far behind. In a half-dozen languages, the papers shout: crisis! If the euro fails, as Chancellor Angela Merkel of Germany said, then Europe fails. That means a recession here, and a likely one at home, which will be blamed on President Obama, and then Rick Perry will get elected, and the leader of the free world will be somebody who thinks the earth is only a few thousand years old. You see where it’s all going, this endless “whither the euro question.” So, you think of something else, the Parisian way. You think of what these people can eat on a given day: pain au chocolat for breakfast, soupe a? l’oignon gratine?e topped by melted gruyere for lunch and foie gras for dinner, as a starter. And then you look around: how can they live like this? Where are all the fat people? It’s a question that has long tormented visitors. These French, they eat anything they damn well please, drink like Mad Men and are healthier than most Americans. And of course, their medical care is free and universal, and considered by many to be the best in the world. 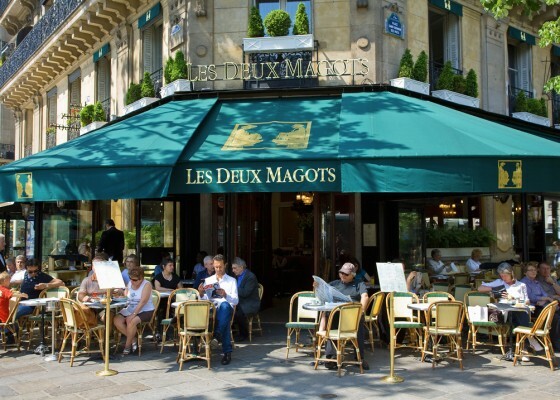 … Recent studies indicate that the French are, in fact, getting fatter — just not as much as everyone else. On average, they are where Americans were in the 1970s, when the ballooning of a nation was still in its early stages. But here’s the good news: they may have figured out some way to contain the biggest global health threat of our time, for France is now one of a handful of nations where obesity among the young has leveled off. First, the big picture: Us. We — my fellow Americans — are off the charts on this global pathology. The latest jolt came from papers published last month in The Lancet, projecting that three-fourths of adults in the United States will be overweight or obese by 2020. Only one state, Colorado, now has an obesity rate under 20 percent (obesity is the higher of the two body-mass indexes, the other being overweight). But that’s not good news. The average bulge of an adult Coloradan has increased 80 percent over the last 15 years. They only stand out by comparison to all other states. Colorado, the least fat state in 2011, would be the heaviest had they reported their current rate of obesity 20 years ago. That’s how much we’ve slipped. … A study of how the French appear to have curbed childhood obesity shows the issue is not complex. Junk food vending machines were banned in schools. The young were encouraged to exercise more. And school lunches were made healthier. … But another answer can come from self-discovery. Every kid should experience a fresh peach in August. And an American newly arrived in the City of Light should nibble at a cluster of grapes or some blood-red figs, just as the French do, with that camembert. Each nation establishes its borders, sometimes defines itself, certainly organises itself, and always affirms itself around its language, says Marc Hatzfeld. The language is then guarded by men of letters, by strict rules, not allowing for variety of expression. Against this backdrop, immigrants from ever more distant shores have arrived in France, bringing with them a different style of expression and another, more fluid, concept of language. Today more than ever, the language issue, which might at one time have segued gracefully between pleasure in sense and sensual pleasure, is being seized on and exploited for political ends. Much of this we can put down to the concept of the nation-state, that symbolic and once radical item that was assigned the task of consolidating the fragmented political power of the time. During the long centuries from the end of the Middle Ages to the close of the Ancien Régime, this triumphant political logic sought to bind together nation, language and religion. East of the Rhine, for instance, this was particularly true of the links between nation and religion; West of the Rhine, it focused more on language. From Villers-Cotterêts on, language – operating almost coercively – served as an instrument of political unification. The periodic alternation between an imperial style that was both permissive and varied when it came to customary practise, and the homogeneous and monolithic style adopted on the national front, led to constant comings and goings in the relationship between language and political power. In France, the revocation of the Edict of Nantes by Louis XIV in 1685 resolved the relationship between nation and religion and gave language a more prominent role in defining nationality. Not long after, the language itself – by now regarded as public property – became a ward of state entitled to public protection. Taking things one step further, the eighteenth century philosophers of the Enlightenment conceived the idea of a coherent body of subject people and skilfully exploited this to clip the wings of a fabled absolute monarch in the name of another, equally mythical, form of sovereignty. All that remained was to organise the country institutionally. Henceforth, the idea that the allied forces of people, nation and language together made up the same collective history was pursued with zeal. What we see as a result is this curious emergence of language itself as a concept. Making use of a fiction that reached down from a great height to penetrate a cultural reality that was infinitely more subtle and flexible, each nation establishes its borders, sometimes defines itself, certainly organises itself, and always affirms itself around its language. While we in Europe enjoy as many ways of speaking as there are localities and occupations, there are administrative and symbolic demands to fabricate the fantasy of a language that clerics and men of letters would appropriate to themselves. It is these who, in the wake of the politicians, help to eliminate the variety of ways people have of expressing themselves and of understanding one another. Some scholars, falling into what they fail to see is a highly politicised trap, complete this process by coming up with a scientific construct heavily dependent on the influence of mathematical theories such as those of de Saussure and, above all, of Jakobson. Paradoxically, this body of work relies on a highly malleable, mobile, elastic reality to develop the tight, highly structured concept that is “language” (Jacques Lacan). And from that point, language itself becomes a prisoner of Lacan’s own system – linguistics.